My Patrons always get to see my WoM Pages – especially the webcomics – first. Here we see some ‘Martians’ kidnapping a human woman from the New York Line and taking her to their own craft. Fortunately for her, New York’s defenders – Hunter Noir and Mr. Mask – are on the scene, door-busting and making short work of the aliens to rescue the poor gal. 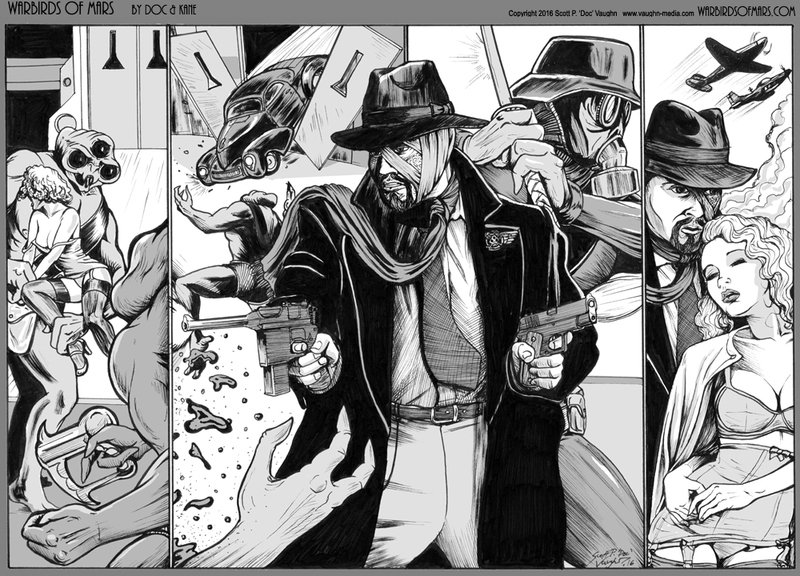 I enjoyed the composition of this; 4 panels with a fifth overlaid in front of them showing Hunter blasting bad guys. Posted on June 24, 2016 at 12:10 am in WARBIRDS OF MARS 1. Follow responses to this post with the comments feed.